Magnetism has always intrigued scholars and ordinary folk alike with its mysterious, seeming magical. 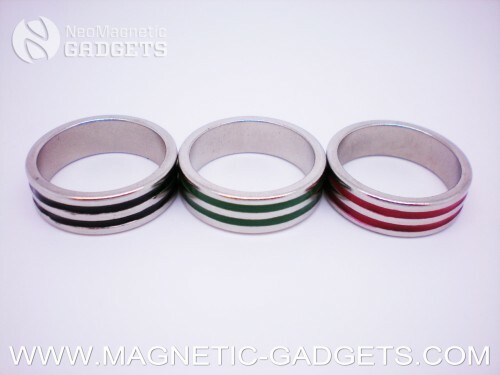 Magnetic Rings, also known as PK rings (Psycho Kinesis) have been used by magicians for years. Now you can get your own at an unbelievable price! The Wizard PK Ring is a Neodymium Rare Earth Magnet fashioned into a wedding band style ring. It’s now available in 3 beautiful and fashionable colors. It will give you a host of unique opportunities to amaze and impress, limited only by the extent of your imagination. And even then, accidents with this ring are an amazing transformation of reality. Vanish paperclips around the office, stop time on a watch, or use it for your favorite PK effect! • Stop time, turn off a Blackberry or make metal items move! • How about an impromptu chopless Chop-Cup! • Your shimmed coins vanish and appear! • Invisibly builds your confidence! Maybe you'll use the all-new Wizard PK Ring to get a promotion, or pick up that chick at the end of the bar. Bottom line, the Wizard PK Ring is a must have.